Coptic Orthodox Pope Tawadros II has taken part in an ecumenical day of prayer for the Middle East organised by Pope Francis, Al-Ahram reported. 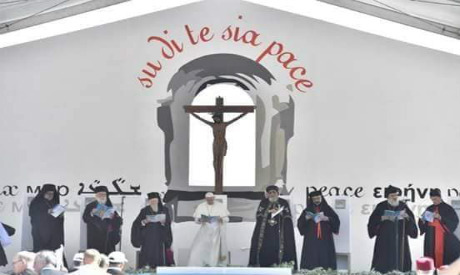 Church leaders from all over the Middle East and the world have joined the Catholic pontiff in praying for peace in the region on Saturday, in the Italian town of Bari. The Coptic pope arrived in the Italian city on Friday to take part in Saturday's scheduled prayers. The Coptic pope and the accompanying Coptic Orthodox church delegation is expected to attend a meeting with the heads of the churches. On Sunday Tawadros II will lead a Coptic Orthodox mass at the Basilica of Saint Paul in Rome, according to earlier reports.